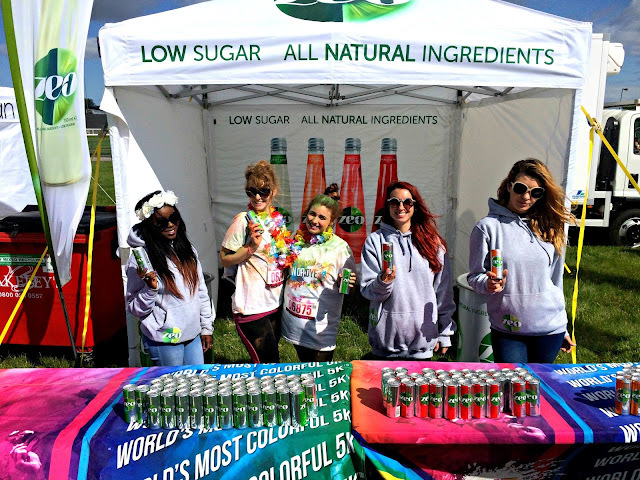 At the beginning of last week, I was asked if I would be interested in taking part in Run or Dye at Aintree Racecourse on behalf of Zeo Drinks*. 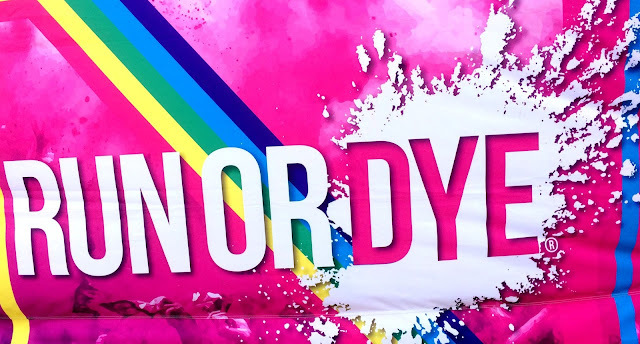 This year, Zeo re-launched last month and have teamed up with Run or Dye to help quench the thirst of participants before the colourful events. Zeo's collaboration with Run or Dye is helping underpin their #BrighterSide campaign, which is designed to help challenge us to change something in our everyday routines to turn our lives from "bright to brighter." And what better place for Zeo to promote #BrighterSide than at the most colourful 5K in the UK! 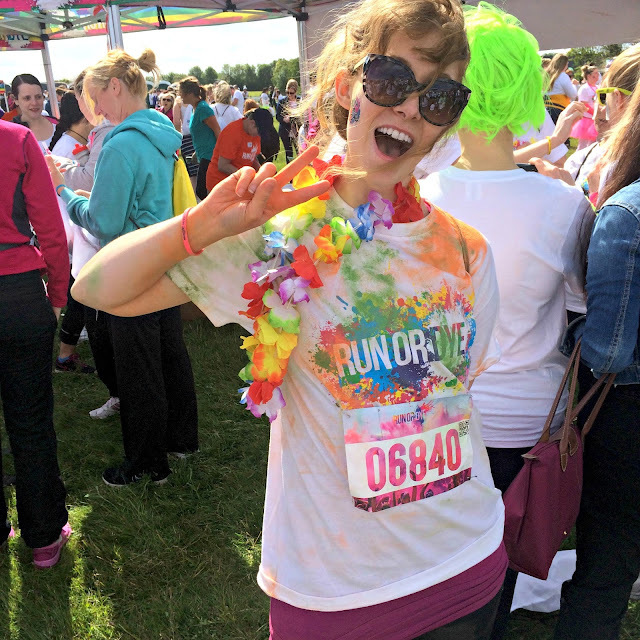 I - of course - jumped at the chance to take part in Run or Dye. 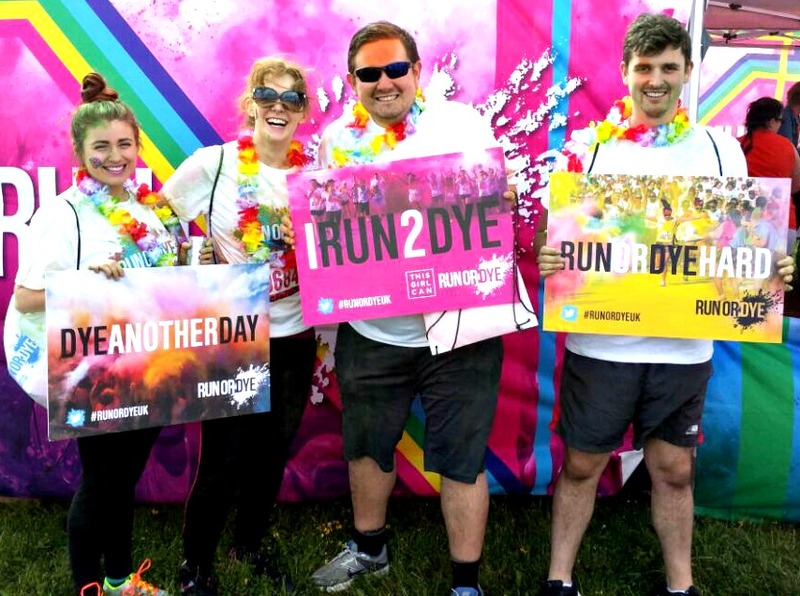 Last year, I had to back out of a Run or Dye event last minute due to a stubborn knee that refused to co-operate, and I was really gutted. So even though the opportunity was last minute, I knew it was one I just couldn't turn down. Especially when I found out that my fellow blogger and beautiful friend Hannah would also be taking part. So on Saturday morning, with both our other halves in tow, we all headed on down to Aintree Racecourse to take part. 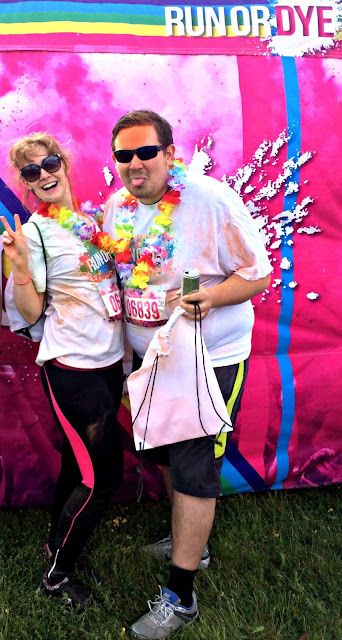 We wasted no time in registering, and donning our Run or Dye t-shirts, race numbers, and the leis that Hannah had bought with her for extra pazzaz. The bag that came when you registered at the desk contained a wristband and one bag of the Run or Dye eco-friendly colourful powder, and we all went a bit giddy trying to get each other covered in as much of it as possible. 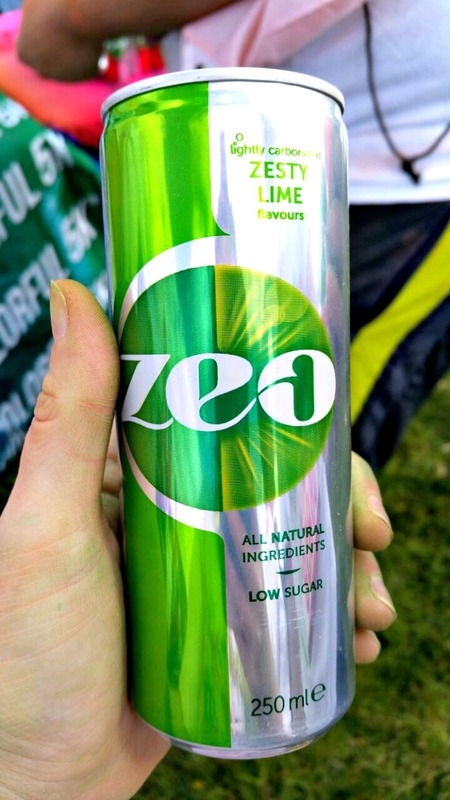 We then headed over to the Zeo sampling tent, where Run or Dye participants could go and pick up a few can of one of four refreshing flavours to try - Blood Orange & Citrus, Zesty Lime, Peach & Grapefruit and Mixed Berry. Between the four of us I think we tried all the flavours, but my unquestionable favourite was definitely the Zesty Lime. It had a really zing to it which immediately helped perk me up and was light enough to not weigh my tummy down just before doing all that walking.... In fact I liked it so much that I was quite cheeky, and made sure I grabbed a second one before the race began! It was reassuring also knowing that all my exercise-efforts would not be in vain by guzzling down loads of sugary soft drinks. After a quick dash to the loo, we all assembled ready to do the warm up, take a few last minute snaps, and get excited ready for the race. 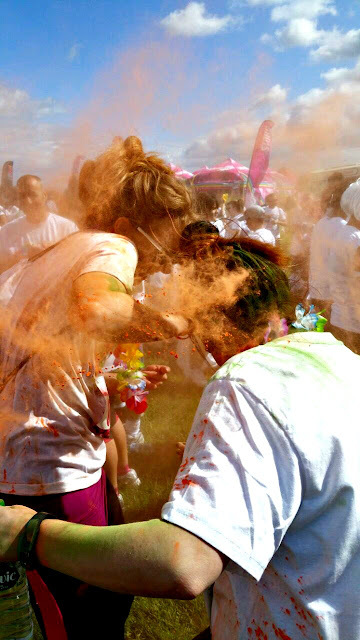 We all decided to chip in and buy a few more bags of the colourful powder to dust on ourselves before we set off. There's nothing like feeling like a My Little Pony to get you race-ready. The Boys thought it would be hilarious to launch some of it as Hannah and I were posing for one last photo, creating one of the best action shots of the day. There was just something about the pre-race atmosphere that was electric, and definitely brought out your inner-child. Run or Dye was a really cool event to be a part of. It's inspiration is drawn from the Hindu Holi Festival - The Festival Of Colours - and boy does it fill your day with colour. After the event I felt like a walking rainbow. And having Zeo there offering samples to the participants was a lovely refreshing touch. With all the new flavours being so diverse there was something for everybody, and it definitely made a nice change from sipping on water. I did try to vlog on the day, but with so much powder in the air it made it tricky to keep my phone safe, but I did capture a few moments pre-Run or Dye to savour the atmosphere, because for such an early start to a Saturday, everybody was definitely in the party mood. So stay tuned for the footage over on my YouTube channel. 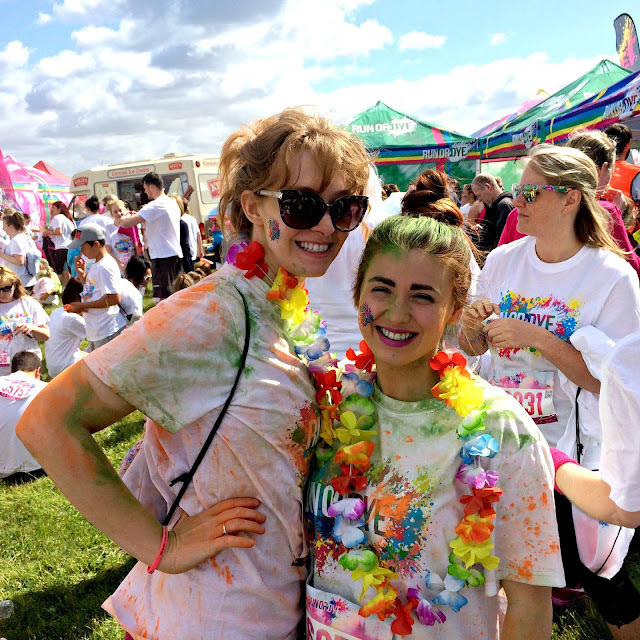 * Zeo Drinks very kindly paid for our participation in Run or Dye at Aintree Racecourse. This in no way affects my opinions. They are 100% honest, my own, and true to my tastebuds.